A bid to call in the county council's decision to take over Preston bus station give it a multimillion-pound facelift has failed. The building was earmarked for demolition but saved when it was given Grade II listed status in September. Lancashire County Council (LCC) cabinet agreed to take it over from Preston City Council on 5 December and has set aside £8m to refurbish it. LCC's scrutiny committee upheld the decision. The leader of the Conservative group, Geoff Driver, one of the six councillors who have attempted to call in the decision, said he had concerns as the ruling Labour administration had "no business plan". Mr Driver said: "The county council is proposing to purchase the bus station but they have no idea how much it will cost to repair and refurbish it and no idea how they will fund the cost. "I'm not saying it should be flattened, but a proper business plan should be done [to] see what the options are and what can be afforded." John Fillis, Labour cabinet member for transport, previously said the aim was to find something that "serves the people of Preston better". 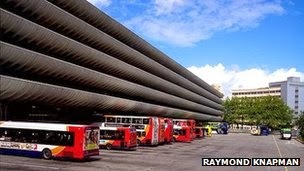 Preston City Council, which was intending to demolish the building before it was granted listed status, said the bus station costs £300,000 a year to run and the estimated cost of getting it up to "modern-day standards" would be between £17m and £23m. English Heritage said the Grade II listing would not prevent changes being made to the building, provided its architectural significance was protected.